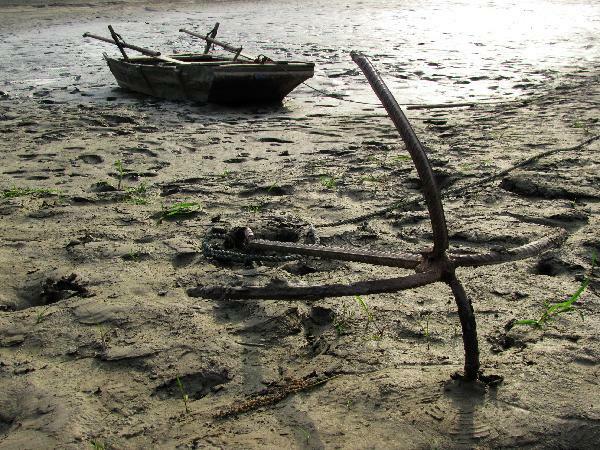 A boat is seen stranding on the dried up riverbed of Hanjiang River in Yunxian County, Hubei Province, May 15, 2011. The Hubei water authority said Monday that a five-month drought has left 1,392 reservoirs useless, with water below the level at which it is considered dead, Xinhua News Agency reports. As of Sunday, water in four medium-sized and 1,388 small-sized reservoirs had dropped below the permissible discharge level, Yuan Junguang, a senior official at the Hubei Provincial Water Resources Department said. Even the Danjiangkou Reservoir, a key component of the south-to-north water diversion project, saw its water levels drop drastically to 4.23 meters below its dead water level on Saturday, he said. The drought has left about 315,000 people and 97,300 livestock short of drinking water, and has affected about 830,000 ha of farmland. Meteorologist Zhou Yuehua said La Nina was to blame for the drought. But Huang Qi, an official of the Yangtze River Water Resources Committee, said the cause was not a water shortage but uneven distribution of water resources. He called for the establishment of a nationwide water conservancy system. Meanwhile, power supply systems in the central Chinese provinces of Hunan, Hubei, Henan, Jiangxi and Shanxi are also facing significant pressure, the State Grid said. Another cause of this year's severe power shortage is China's push to transform its economic development pattern by encouraging investment in emerging industries, such as new energy, Xinhua News Agency said.